Jackson Creek flows southwest of Jackson where it is dammed to form Lake Amador and then dammed a couple more times before flowing into Dry Creek southwest of Ione. The Jackson Creek Bridge (26C0047) carries Buena Vista Road over Jackson Creek south of Ione. It's a cast in place, prestressed concrete box girder bridge on a single column bent and seat-type abutments. The bridge has two 118 ft long spans, a 32.8 ft wide deck, and it's on a 30 degree skew. It was built in 1994, it carries about 1850 vehicles a day, and has a sufficiency rating of 96. This type of bridge is preferred by contractors in California. They have plenty of forms and falsework, and can build this type of bridge cheaply with a minimum of labor. However, the federal government is pushing California to do more accelerated bridge construction using precast bridge elements. I took the photo (above) in the winter but when I came back in the spring the bridge was surrounded by foliage including lots of poison oak! 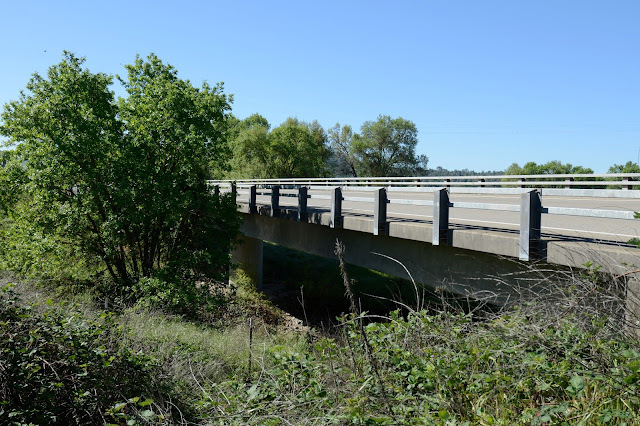 Amador County, California Bridges: Buena Vista Road Bridge across Jackson Creek by Mark Yashinsky is licensed under a Creative Commons Attribution-NonCommercial-ShareAlike 3.0 United States License.